Brain nausea reflex. Artwork of the location in the brain of the area responsible for the various nausea reflexes, and some of the causes. Part of the base of the brain (seen from the side, front of the brain at left) is seen at centre. Several coloured areas are seen in the brainstem, an area of the brain responsible for basic reflexes like breathing. 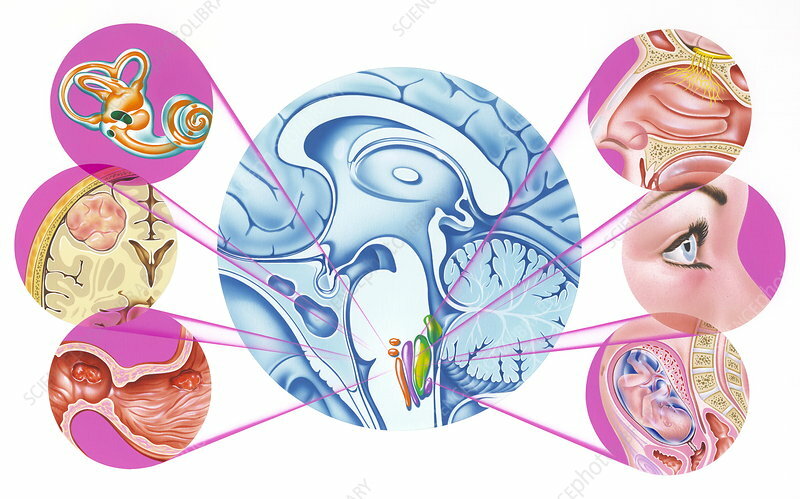 Nausea can be triggered by (clockwise from upper right): smell (olfactory nerves shown), sight, pregnancy, bad food (sectioned stomach and duodenum shown), a brain tumour, or dizziness (the semicircular canals of the ear that give a sense of balance, are shown). The reflex, if triggered, provokes vomiting and emptying of the stomach.